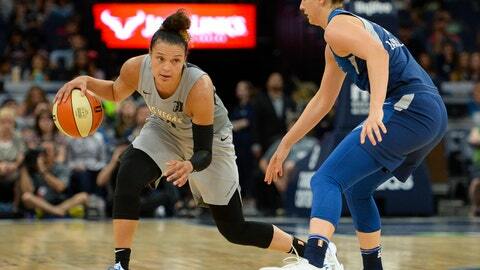 NEW YORK (AP) — The Las Vegas Aces are still waiting to hear what the WNBA will do about the game the team decided not to play after a long travel day. The Aces’ contest in Washington was canceled Friday night about 1 1/2 hours before the expected tipoff. It took the team nearly 26 hours to travel to Washington from Las Vegas after flight delays and cancellations. By the time the Aces reached their hotel in D.C. it was 3:45 p.m. — roughly 4 hours before the scheduled tip. Swords said that the team met, talked by phone to the union on Friday and then called the league to express their decision not to play Friday night. “We requested the game be postponed and rescheduled and understood there may be consequences for this,” she said. Playing Saturday wasn’t an option as Washington was flying to Dallas that morning for a game Sunday. Las Vegas flew to Connecticut — without issue — on Saturday for its game Sunday. The two teams play virtually every other day over the next two weeks, making rescheduling it before the season ends on Aug. 19 nearly impossible. A lot of teams are tightly bunched in the playoff race and the Aces currently sit in ninth place in the standings, 1 1/2 games behind Dallas for the final playoff spot. Washington at 15-11 and in fourth place, 1 ½ games out of second place, which would get them a bye to the semifinals. The Aces players released a statement through the union Friday night after the game had been canceled explaining their decision. Swords reiterated the team felt badly for fans who had bought tickets for the game. The Aces got to the Las Vegas airport Thursday afternoon and their flight kept getting delayed. They were in constant contact with the league and the union about their travel issues. According to the team, the league even approved letting them take a charter plane from Las Vegas to Washington, but none were available. WNBA teams aren’t allowed to fly charter because of the cost and the competitive advantage it could give some teams willing to spend the money. The New York Liberty had a similar situation a few years ago, when their flights were canceled for a trip to Indiana, so the league allowed them to take owner James Dolan’s plane to avoid postponing the game. The Washington Mystics weren’t happy the game was canceled. The players tried to make the best of the situation for fans that were already in the arena, giving them an autograph session with the Mystics players. All fans who had a ticket to the game will receive a complimentary ticket to a future Mystics game. Swords hoped that a productive discussion can come out of this situation for the next CBA so that it doesn’t happen again.